Many entrepreneurs today grew up playing Ultima Online and other role-playing games. Gaming can teach you many things, including problem solving, how to look for clues, group dynamics – and game theory. Equipped with such skills from his days gaming as a youth, Bill Karamouzis started, grew and sold three successful gaming companies. Today, he’s starting his fourth – TeachMe.com – and with two young daughters at home, he is shifting his focus from time-killing games to games aimed at making math skills fun and rewarding with Math Games. Bill Karamouzis is an entrepreneur and online media specialist. His latest venture is TeachMe.com, and his first product offering is MathGames.com. Previously, he founded FPS Networks and developed the popular gaming websites FlashPlayer.com and AddictingGames.com. In 2005, Karamouzis successfully negotiated the sale of these two distinct business units to media conglomerates Viacom (then Atom Entertainment) and Hearst (then UGO Entertainment), respectively. Those sales were substantial enough to require approval under the Investment Canada Act, and Karamouzis was one of the largest shareholders of Atom Entertainment when it was acquired by Viacom for $200 million in 2006. In 2008, Karamouzis launched Hallpass Media, a collection of gaming websites, which he sold in 2011 to MindJolt, a company founded by Chris DeWolfe, founder and former CEO of MySpace. Today we’re going to hear from a entrepreneur that had 3 successful exits and is also a significant investor in exact match domain names. In fact, he has a brand new startup where he’s using a killer exact match domain coupled with his gaming knowledge and experience to revolutionize the educational learning industry. It’s a great interview that goes into a ton of detail about domains and startups. You do not want to miss this interview. Stay tuned. Michael Cyger: Hey everyone. My name is Michael Cyger, and I’m the Publisher of DomainSherpa.com – the website where you come to learn how to become a successful domain name investor and entrepreneur directly from the experts. Today we have got a fantastic education startup that we are going to learn about, and it is being led by one of the nicest guys you have ever met. I have had the honor of interviewing him onstage at the TRAFFIC Conference in October 2011 and I have been a big fan of his ever since. So today’s big question is this. How do you gamify the education experience to help kids learn better and faster? Joining us to answer this question is Bill Karamouzis, CEO and Co-Founder of Teach Me. Bill, welcome to the show. Bill Karamouzis: Hi guys; thanks Mike. Happy to be here. Michael: It is great to have you here, bud. For anyone that does not know you, I need to give a quick rundown on your background. Bill is an entrepreneur and online media specialist. He founded FPS Networks and developed the popular gaming websites FlashPlayer.com and AddictingGames.com. In 2005, you sold both of those, Bill, to media conglomerates Viacom, who at the time was UGO Entertainment, and Hearts, who at the time was UGO Entertainment. Then, just three years later, in 2008, Bill, you launched Hall Pass Media, collection of gaming website with thousands of games and millions of monthly users, which you then sold in 2011 to MindJolt – a company founded by Chris DeWolfe, who is the famous founder and former CEO of MySpace. And if you want to hear the full story, you can search for Bill Karamouzis on DomainSherpa and watch that interview from TRAFFIC 2011. It is in the DomainSherpa archives and it is well worth your time. So, my first question is this, Bill. Do you ever take time off? Bill: Yeah, I mean it is a pretty busy schedule. We actually had a little bit of downtime when I left SGN. Around three months where there wasn’t a major project that was going on, but even in that time, we built a couple side projects. So, not too much time off, but I enjoy it, so it is not like I am working. It just varies if I am getting actually paid for it or not, so it is a hobby, so not some time off. Michael: Great. And so you have just launched MathGames.com. Congratulations. You had an article write-up in AlbertaVentures.com and DN Journal – their latest cover story. I will have links to both of those underneath this video so people can go and read those. So, I want to start off with: Why MathGames? What are you trying to change with launched MathGames.com? Bill: And just seeing the experience, I felt this does not tie into any of the stats that we provide. We have really good insights into what children are doing at any age, even if it’s in or before kindergarten. How many questions did you get right? What is your struggle? All these kinds of things that, as a gamer, you can see. We collect all of these stats, but these apps that I was downloading, and I was going through quite a few, were not doing any of that. So I felt this is going to be a pretty fun project and I think that we can do a whole lot of good stuff in it, and so those are some of the reasons why we went into it. Why we picked math is because some of the things that you look at from –how big can you be – is that math is universal, and one of the greatest things about it is, with some language translation, you can standardize it across the whole board, so people all over the world can play on level playing field and competing, and doing all sorts of things that I think are going to drive up engagement. Competition, in my opinion, is one of them, but the best ones – friendly competition, but it is interesting to have leader boards and see what countries rank or what states or provinces or what schools. And we can do all that with math because we can standardize it, so you are getting kind of the same view across the board. Michael: Very cool. And so, I have gone to MathGames.com. It is a slick interface. It is beautifully designed. You have great caricatures and icons, and there is a lot of white space. It is much different from the gaming experience that you have had in the past. We both used to play Ultimate Online and all those fun games. But what I did not see on the website was the business model. Bill: Yeah. I mean right now it is a bit vague, and it is vague because we are working on it as we go. The main focus right now is actually product. A lot of times, when we discuss this, it is: “What are we going to look at? Monetizing; how are we going to do it?” I feel like you have to earn the right to really charge people now. And until you add that value, I feel like we are focusing on the wrong thing. When I think of at what point do I want to be able to say, “Okay, let’s start charging people for a portion or add-ons to the service,” I want like the Netflix of that, where the first time I logged into Netflix, I was blown away. I could not believe that this was seven or eight dollars, or whatever I paid at the time. And I think that we can do the same thing, and that is what I want to do. So, until we have added enough content and value and got the feedback that we have, we are going to be focused exclusively on product. Bill: If we want to say, “Okay, we have achieved that; now where are we going to look to monetize,” it is a few different opportunities. One of them is advertising. That I prefer to stay away from because I think that it degrades the whole product experience, and the whole career is going to bounce between great product and horrible advertising. So, if I can, I would like to stay away from that, but that is one. That is the baseline. The other opportunity that I think that we have is, as a company, when you look at –getting people on mobile devices, it is incredibly difficult. If you look at the iTunes Store…any kind of distributed model of online, mobile products, and it is like a funnel. You have these thousands or hundreds of thousands of apps and they funnel down into a little list of ten. And if you are not on that list, discovery is really, really difficult. Well, with education, our apps do not monetize well. They are not going to beat out the games that are upselling you constantly. Bill: And so you are never going to really be able to acquire users at a rate that made sense. And to get on those lists, a lot of times you have to prior users. As part of kind of getting that viral effect is maybe you try to find some users, advertise to them, they tell their friends, and you kind of build this little virtual cycle that kind of lists the whole game up in the rankings. It is difficult for educational games to do that. So, what we think is a good way of approaching it is you have web, which is really open; a lot of people using it. Build this platform for free. Get people to understand it. TeachMe powers this. It has some authority in the space with great analytics. And then distribute games from our website and use our website to kind of promote these games in iTunes. So we own kind of the whole ecosystem. We are not depending on the fluctuating rates of advertisers and whether or not the quality is good or whether the users are real, or they want the product, or they are loyal. All these things. We are taking users on their existing platform and moving them kind of to the mobile devices. So I think that is a big opportunity because we have been successful in the past, at our previous company, when we were making games for kids and they were playing on the web. And millions of people on the web, and we took that as a powerful funnel and we targeted towards the games on iOS devices, and we were pretty successful because most mobile developers do not have that big web background that they can push to iOS and Android devices. So that is an opportunity. A lot of our competitors use the subscription model method, where they are charging a fee. Again, that is something that we would consider. Whatever features we roll out with we are going to grandfather in, so the majority of our product will always be free. I do not think that we want to be a company that prevents people from learning; that I think a lot of these pay walls do that. And it is not because the fees are high, although in some cases a hundred dollars a month is quite high, I think it just blocks people; that parents do not want to give their credit cards and things like that, and then you are preventing someone from kind of being on your platform. So, we are really going for growth. We are going for users. And at that point, I think we will be able to see what the best business opportunity is that does not degrade the product, because this is a lot more about the product than it is about how to make the most money. Bill: It sounds quite odd. I mean we do want to create something of value and make money doing it, but we want to have something that we are really proud of. And coming from a background of selling ads for fifteen years, it is fine to kind of take the foot of the throttle and focus a bit more on the product. Michael: Definitely. So, clearly math games are an enormous market. I have got young kids in school and I have thought about what are the best ways to teach math to my kids. I have volunteered in class and I know that teachers love to go to computer lab and love to have a well developed software system that they can just tell the kids, “Go to this website and start doing different lessons,” and get feedback, and sometimes they have to go through and do it again. And they will do that for like fifteen or twenty minutes, and then they will switch to another subject. If you look at the market for trying to solve this problem of producing a better gaming experience that has friendly competition and allows kids to learn in a more effective way, do you know how big the market is? Have you guys thought about even how to quantify that? Bill: I mean there are a number of studies that you can look and see how many educational downloads are going through Apple. They release those figures. The overall market, I think, is a bit vague of what you consider educational software. Where is starts and where it stops. Bill: And probably it is really a competitor to certain systems that they might include in those kinds of figures. So, we have not gone to try and quantify. We think the opportunity is large enough that by tackling this problem we will be able to kind of take the significant size. And if we can, that would be enough to sustain a valuable company. And we get those figures just from strictly the gaming side. If you look at the education side, there are competitors out there. Michael: Bill, right when we got cut off there, you were talking about the market size, and you have quantified the market size for games and you have quantified the market size for education on iTunes, for example. If you had to put a number across the whole thing, what would you think the size of that marketplace might be? Bill: I mean I have not attempted to do that, but I mean I think it is hundreds of millions of dollars, if not more. Just education is one of the most popular sections in iOS. Bill: And so, I really do not think that that would change our opportunity. I think the size is so big that whether the number is a billion or two billion, or five hundred million, the size has always been enough that we did not really focus too much on what that number would be. Bill: It would be good. Eventually I will try to quantify that as much as we can so we can present something if we had, but at this point it is really not a science. Michael: So let’s talk about who is behind this new venture, Bill. Can you tell me who the key team members are, and how many people are involved, and where you are working? We have been lucky to get some really, really brilliant people on this. One of them unfortunately just left because he is going to get his PhD in Plasma Physics from Princeton, so virtually anyone on our team is smarter than me and better in math in every way. And not virtually every single person, but it is a neat kind of team that we have put together. Michael: Excellent. And so you are a startup. You have eleven people. You are in a startup environment, so there is a lot of action going on. Typically, startups are funded by either angel investors or they have taken some seed money, or they have got venture capital behind them like your last firm had – Hallpass Media. How are you funding this new venture? Bill: Well, it is funded entirely by myself, so some of the proceeds from the previous sale and just using it to do this. This is something that I really want to do and I think, by funding it myself, I can really focus on the product and start the company off in a way that I want to. If we go to someone and really have to explain the model without showing it, I think that would be using a lot of time that I would rather just focus on the product, prove it out, and like I said, in six months, the way that I present the story is less important to the numbers I think I can present. Because if you have these really solid numbers that anyone can look at, then the story becomes really easy to sell, and I do not have to wear the salesman had, which I am kind of an introverted person. I do not think that I will do that very well. But if I have some good numbers, we can talk. We can walk through them. We can see what value we provide. And I think to an investor potentially that is in this space, I think they will look at those numbers and be like: “Okay, that is great. Your team. You executed. You had some previous success. Let’s go with it.” Right now I would just be too conceptualized and I think too much more than I would like to be. I would rather come to the table with something and see if funding is even the answer, because using things like this environment that we work in and other things that we have done to keep our costs pretty low, I think our burn rate is pretty stable and I think that we will not need to monetize that at a rate that other companies would have or are having to, to be sustainable in the long run. So, we will probably cross that bridge and start looking, like I said, after six months; once I think the product is ready, and see what the longer-term future is. And if we cannot achieve the growth that we want because of funds, then that is when I will look at it. But if we can keep achieving the growth that we are doing and it is just a matter of bootstrapping and working through it, then we will probably continue that way. Michael: Hey Bill, which came first: the idea of the business or the domain name MathGames.com? I should say which came first: the idea for the business or the acquisition of the domain name MathGames.com? Bill: The idea, definitely. Then, looking for the right domains. We needed areas for curriculum. Math was one of them, but there are other areas. The kind of theory of using games to kind of drive education can be applied to many different subjects. So, we went for math. We went for a few other ones, and it just was not there. I was not able to close the deals and the idea was there. We were already busy with the Hallpass Media. I mean it was already operational. We did not need to have this other division, although I wanted it quite badly. And so the idea came first. Being able to secure MathGames and kind of getting to that point really just accelerated it, because there were alternatives of course. In any venture, you do not have to get any single name for it to be successful. So, we could have gone live on a different domain, but getting that one, when it happened, it really kind of motivated us to get this to market as quick as we possibly could. Bill: Since MathGames, I bought LanguageArts.com, and that is another area that Comcore has developed standards for. And initially, TeachMe would have been kind of our default if we had to run it all on TeachMe, and that is a fantastic name in itself. So the fact that we got MathGames was a big bonus. If we could not, we would have ran it on TeachMe, and I still think it would have been there, but definitely having the type-in traffic at MathGames we hope will accelerate it. Michael: Yeah, so let’s talk about type-in traffic. Google AdWords Keyword Tool estimates the search volume of the exact match phrase ‘Math Games’ to be five hundred and fifty thousand per month in the US. That is massive. Bill: Yeah, I mean the entire industry does not know how big math games are. Even I did not really believe it. And seeing other parts of gaming having the same effect and they are kind of cooking games, for example, was this thing that when I had seen that I could not believe how many people were searching for it. So, yeah, the volume is massive. The type-in traffic is one of the largest I have ever seen on a purely generic name that is not a typo or a variation of an existing site. It is just two words put together, so it gets quite a bit of traffic. Michael: Yeah. So, in 2010, you were a cover story for Ron Jackson’s DNJournal.com, and Ron wrote, “Few domain sales have set more tongues wagging than one we reported in our first weekly sales column of this year. CookingGames.com had changed hands for a stunning $350,000 but, even though we had carefully verified the sale with reliable sources, a lot of people – even industry veterans – had a hard time believing the transaction was real.” To you, however, $350,000 was not out of the realm of acceptable because you knew the value of the keywords. You knew how big the audience was; how many people were searching for it. So that, of course, leads me to my next question. How much did you pay for MathGames.com? Bill: So, MathGames was $725,000. It was one of the largest purchases that I have ever made for a domain and it will probably be one of the largest purchases this year, so yeah, it was a big domain and the seller was not overly motivated because of that type-in traffic. It was making parked income. The same at CookingGames was making fifty grand a year parked, so the motivation to sell it is not that high when you have this income. Whether you are dead or alive pretty much, you are getting all this income. So, MathGames had the same attributes, just as a larger scale. Michael: When did you buy? When did you close the acquisition for MathGames.com? Bill: It was in the first quarter. We bought it and we had to finalize some kind of internal shareholder documents with Rhys and myself, so probably in January. Michael: Yeah, and did you buy from a domain name investor or a math teacher? What was sort of the persona of the person that previously owned it? Bill: I mean this in a nice way, but I think that he is quite crazy. I do not know much about him other than he lives somewhere in Asia and lives sometimes in the States. And I emailed him back and forth since 2008 and he was completely erratic. And he seems very, very nice via email, but I do not know much about him. And that is quite common in the purchases that I have done; is I do not know very much about the people that I buy from. But I think he did have a portfolio and he liked to really keep his privacy. And told him what I wanted to do with it and what the plan was, and then he just came around one day out of the blue. It was just a very odd email that I received and he was willing to go, and I closed it as quickly as I could. Michael: Were you worried that the transaction was just going to fall apart because of your prior conversations with him over email? Bill: I did not put any hopes into it because I did not know, although I wanted him to close because the way that using Escrow.com works is you have to fund it, so you do have to go through this process of funding the whole thing. And then, if he does not come through – I mean you want it to close if you are going through it. Bill: It was a completely smooth transaction. And if I did not have conversations with him prior, I would have thought he was a completely normal person. Michael: Right. Do you remember back to your very first communication with him, where you made an offer to him to try and get him motivated? Do you remember what that number was? Bill: I think it was probably around three hundred thousand. Bill: And I think he just said thanks. Michael: Because he was making enough revenue off of parking, I guess. Bill: Like I seriously underestimated how much was even going there. So, I knew when I said that and he did not even counter that, it got me thinking. “Okay. Well, if CookingGames is making this, maybe this is making who knows what.” And so I Really just kind of kept going up, kept going up, and then, at a certain point mentally, I was like: “I have countered myself too many times. This is ridiculous.” And step away, then come back, and he was always polite and friendly with no confrontations. I think a lot of times he just ignored me, which is normal for this stuff, when people just are not interested in selling. Bill: Eventually came around. The TeachMe domain I bought from a Standford Professor, and he was a really nice person. He was the only person I ever had to speak to on the phone to do a domain transaction. And so, when I saw the email said, “I would like to speak with you,” I did not know what to expect. And he was very, very nice and explained kind of the stuff that we would be trying, and he did not want us to flip the domain actually, because he was concerned that as a domain investor that I would take it and I had a buyer in toe. And so we put a clause in there for about two years that if we sold it, he would be entitled to profit just to kind of make it secure that was not my motivation. Bill: It worked out okay and now I think that he could be someone that hopefully can look to, to advise us on some of the stuff that we are doing. So, he owned that. And LanguageArts, which is kind of part of the package was just owned by a domain investor. They were looking to sell it and there was not very much interesting on that sale. It was just a very standard ‘would you like to sell’ and bit of back and forth. Michael: Yeah. So, on the valuation of MathGames.com, 725. If I go to Google and I do their Google AdWords Keyword Tool, I can see that it is a $0.65 cost-per-click for the keyword phrase ‘Math Games’. It is relatively high, but given the volume that happens per month it is massive. If I plug those numbers into the Rosener Equation, where Andrew Rosener has come on and talked about how he values generic keyword phrases like math games, none of this is hard in stone, but it puts the value around 1.5 million dollars. If I plug it into EstiBot.com, which looks at the same sort of factors, but it also looks at other sales and things like that, it puts it at $245,000. It is a big range, which any domain name broker would say, “Yeah, it is going to be a big range, because domains like this do not come around very often. They do not sell very often. And when there are sales, they are not public,” unlike yours. Do you feel that 725 was a fair price at the time or do you feel that you overpaid, thinking that it would appreciate in value? Bill: Well, first off, I think that Andrew’s equation is better. No, with everything that I buy, I think that I overpaid and I think that I overpaid until I develop it. And it is a mentality that I have because it makes me not want to sit and be idle on it. So, no matter what the price is; I think I overpaid on LanguageArts.com, because it is sitting there and eleven thousand dollars was a lot of money. In any economy it is still a lot of money. It is not valuable until I build it out, and so I have overpaid for it. Now, if you want to look at like absolute numbers, did I overpay? And I think I could have probably maybe got it for a bit less, if I would have been more aggressive on negotiation, willing to lose that opportunity – that window that he was hoping for…I probably would have got it for less. Weighing that against the opportunity of having and building it was just one of those things where sometimes we really want something; you are going to have to pay. And if you are willing to do that, it is kind of what do you want to be working on and that sacrifice, and it is something that I was willing to do. But yeah, it is an expensive domain for sure, and to just leave it parked it would not have made sense to do that. It would not have made sense just to buy it and park it. Michael: Right. People often wonder about type-in traffic, Bill, and you said that the type-in traffic was higher than you had anticipated earlier in the show. I want to check my numbers. According to an estimate of data I looked up on EstiBot.com, they have this little area where they gathered information from the past and they use it sort of as a proxy for type-in traffic going forward. I was amazed that they had this data and I was surprised when a couple of domain names that I have that have much less type-in traffic than yours, it was actually right on the order of magnitude. So, EstiBot thinks that MathGames.com receives about seventeen hundred or eighteen hundred type-ins per day. That is people just typing in MathGames.com. Can you confirm that metric on an order of magnitude basis? Bill: Yeah, it is definitely in the range. I mean the domain is very seasonal of course, as you would expect. Michael: So, down in summer; up in fall throughout the school year. Down in Christmas and holiday time period. Bill: Yeah, in certain areas, like in Christmas, leading up to the big holiday break, it just had a lot of traffic historically. So, it follows a bit of the same pattern that cause game sites follow, so it is a pattern that I am kind of familiar with in terms of seasonality. When people are in front of their computers, it is popular. When they are not, in summer, it dips down. But yeah, seventeen hundred I think would be a fair average. It has spiked to the thirty-five hundred, which is a lot, especially in this day and age. 2008 it was probably at over five thousand. Bill: Yeah, it would not surprise me if it was. Michael: Yeah, fantastic. So, you talked about, in the DN Journal article, you that you said, “In addition to the domains that you purchased from Chris Chena, you purchased portfolios from IREIT, Marchex and a number of other domain investors. In total, you spent over four million dollars on domain investments in the last two years.” If you spend $725,000 on MathGames, how many other domain names did you purchase for four million? Bill: Yeah. So, that figure though is over a period, since 2008. So, the range is longer, but I mean having domains like Animation.com and Draw.com, ExecutiveMBA.com, MarketReport.com. So, gone through and purchased just a lot of really good names and things that I found that might be interesting to build out at one time and another. And when we came back from Los Angeles, that was some of the things that we did to our portfolio and we looked at all of these opportunities. And the one that stuck in my head and I just could not get rid of that desire to do something in that space was education and gaming and see if we can make it better. So, I have a pretty good portfolio of quality stuff that I would be happy if everything in it got built out. SmallJobs is another example of something that is neat, and I think that we could do something there. Michael: Yeah. So you do not necessarily own all those domain names still. Bill: Exactly. Some of them have been sold. Ones that I think: “Okay, I am never going to be able to develop this domain name. It is just too much backlog and I am not as passionate as I was when I bought it,” I need to sell it. Michael: Got you. Did you buy any single domain name for over a million dollars, Bill? Bill: If you look at the portfolio, depending on how you chop up the value, them maybe you could say that. Bill: But it would be subject to kind of interpretation. DressUp was a domain name that was really expensive. Michael: Yeah, but DressUp – didn’t you use that one for Hallpass Media? Bill: It was in Hallpass Media, yeah. Bill: It was insanely expensive. Actually, what happened with that site is it received around five thousand type-in a day from kids looking to do fashion; dress up things, dress up dolls, and things like that online. But the reason why I paid so much money is because advertisers on that page were advertising cosmetics and clothing, and higher kind of value items, so you drove this gaming crowd into a funnel of really kind of higher-end advertisements and it just ended up working and it made a lot of income that way. Bill: It was very expensive. Michael: So I know a lot of investors who have good domain portfolios think about developing all the time. You have a phenomenal portfolio. You and I have talked. I know some of the domain names that you have in addition to MathGames.com, which is clearly public. And you have got a great partner that was your partner in Hallpass Media. You two are Co-Founders in TeachMe and MathGames.com. But Rhys did not buy the domain name, so you bought the domain names. Now, I am sure Rhys did well from selling Hallpass Media as well and he was locked into an employment agreement with the previous owner and I am sure did well. I do not know any of those details. But a lot of domain investors are probably wondering how did you structure going forward with your Co-Founder given that you own the domain names that were bringing in traffic on day one. Bill: Yeah, I think a lot of domainers seem to think it is a very complex process. The way that we are structured is the company actually owns them. So, we have a company and the company buys them and creates income, and it is run mainly because of the previous three sales as a normal organization would run, even though there are not a lot of people behind it. So, the company went and purchased the domains, and I am listed there, as a Co-Owner, but the company owns them and I am the majority shareholder of the company and Rhys has a significant portion in the company, which translates to having significant portions of the domains that we develop. So, it was not overly difficult. I do not think that domainers — if they find someone that they really want to partner with, I do not think that should be the excuse of not being able to strike up a partnership, because I am not going to give corporate structure advice, but I mean I think you can just put it underneath the corporation and divide the shares. And if that is the only asset, then you kind of have yourself. Michael: Yeah, so if you are both putting in your time. Let’s say there was only two people in the startup and one came with $725,000 worth of domain name assets that they were contributing to the company, and you are both going to split time, then you both just need to agree what the share split of the company – what the equity of the company – is going to be. Bill: Exactly. And the ranges and things like that. The company has ongoing revenue because it has its portfolio, and so it is just taking out of it. And so it was a process, but it was not overly complex to get things worked out. And also, of course, I have worked with Rhys. I have known him since high school. He is one the most brilliant technical people I know. So, all those kinds of things that might make someone worry or might put in like vesting and other things, which are definitely recommended in most cases, it was not an issue for us. So we were fortunate that we could do it like that, but for other people that are looking to bring on a partner, you probably do something like vesting and other things that you have to look into to kind of secure you did not giveaway a big portion and the person did not work out. If you are a majority owner, you are letting someone come in that does not really have a significant stake in the whole value of it, which was not our care, but other people might. Michael: So you talked earlier about how buying MathGames.com sort of lit a fire underneath you to get going on it, because you had a lot invested in it. And you talked about you could have bought a brandable domain name, like MathGamesWorld or eMathGames.com, or something like that for relatively pennies compared. In your opinion, how important is a keyword generic domain name to the success of a business if, in your own words, the most important thing is the business itself? Creating a user experience. Making sure that kids are learning from this new environment that you are creating. Bill: I mean I often say that because people look at what I have done and they think: “I am just going to go out there and buy this domain.” And there was not all this infrastructure behind it. We did not have the game library of fifteen thousand games and spent ten years doing it. And people went and rushed out and bought a bunch of game domains, and people then asked me how did I develop this. “What is wrong? I have the same games as you on your site.” Some people even ripped our site. So, I definitely say that because I do not want people to get the perception that that is all that is there. So, we are going to look at MathGames as kind of like an advertising tool. Branding and advertising, depending on how you want to structure it, they are the same. It comes with type-in traffic. To buy that traffic, to get that visibility, you mentioned $0.65. Well, if that is the going rate and there is seven hundred new people a day on it, I would say a thousand. You can kind of work that out and you get that figure, and so now I do not have to go and I do not have to make those campaigns. I do not have to verify how successful they are. And when you are a startup the way that we work, to manage a budget that size takes a person who knows what they are doing. Michael: Yeah, good point. So, you are in a startup environment there, Bill. Literally the location that you are has other startup companies in there. Some of them funded; some of them not funded. What is your advice to other startups in Canada that tell you, “Bill, every domain name is taken”? Do you ever suggest that they go for a .CO or a .IO or a .ME domain name? Bill: I do actually, and some people would be surprised, but you are validating an idea, and sometimes get a .CO. Build out the idea. Build out the product. Get it there. Do not go to aggressive on the .COM until you have built it. And I say that in the startup environment when we have tons of ideas going everywhere. And if everyone was going out there, trying to buy the best .COM on day one, they would be stuck with a lot of inventory that is not good. So, .CO – the greatest thing about it is it is cheap and it is available still. So go get your .CO. If this thing has traction or you have spent time and you are like: “This is going. I am committed. I really think I am going to go for it,” before it gets too big, then you go for the .COM. You do not have to get the .COM on day one. When you are deep in product development, go for .CO. Go for a country code if you are in an area that that is popular, like Canada (.CA) is very popular in Germany. It is very popular in many part of the world. The United States, I think your country code is basically .COM because I do not think .US has really taken off, but even .US and .IO. There are many extensions you can get early on. But of course, know that if you wait too long that .COM is probably going to start receiving type-in traffic, spill over traffic from your venture, and you might end up paying more. It is a tradeoff that you are going to have to manage or make business decisions that maximize your capital and how you want it to deploy it. Michael: Yeah. So, anybody watching this that goes to MathGames.com can see that it is not a “complete website”. I think you might be missing privacy terms and things, but it is a BETA launch or it might even be an ALPHA launch. I am not sure what you consider it, but you are targeting the fall, when kids go back to school, to have it up and running, right? Bill: That is right. So, we need almost to launch this because what happened was we came back from LA, we reached out to some local reporters and said that we are here. We are back. We are looking to build a team. It would be great if we could just get some coverage and kind of get our names out. And ended up doing a pretty in-depth story on me, and we were at the kind of mercy of when they ran it live. So, when we found out what issue it was going to go in, we really had to just launch. Ideally we would have kind of waited maybe a little more, but at the time, right now, we do not even have a user sign in, so we are not collecting information about users. But definitely, the kind of bits and pieces day by day are actually – our build releases are kind of moving us ever day a step closer. And we labeled our site saying it is BETA, so you are participating in a product that is not finished, but you are still getting a lot of kind of the analytics and stuff like that, that are showing progressively through are still happening. So, we needed to get it out there because, even internally for the team, it helps just to get something out there. If people are kind of knocking on your door with type-in traffic, I would rather show them a product that needs improvement rather than a parked page. Michael: Yeah. So, Rhys, your Co-Founder, is the technology wizard, making the site look beautiful and run, and be scalable and be secure, and all those things that are requirements for this type of endeavor. Usually the Business Co-Founder will be out raising money, talking to investors, and talking to the press. You are your own investor. You are funding it, so you do not have to spend your time doing that. What do you spend your time on with the startup right now? Bill: The frontend and actually the design and the layout and the kind of back interface has always been in my area, because that is the stuff I love doing. So, in terms of design, look, icons, how it flows, and things like that, that is in my court of the technology side of it. In terms of a business side, I still went through the process of completing it. It is very important. It is a pretty in-depth document. I would recommend people go to Sequoia Capital’s website and there is an area where they have a business plan. And in the last few really tough questions, well, I mean it is tough depending on how you look at it, but getting really good answers for some of these questions is difficult and it makes you think, and it makes you have to do your research. And so Sequoia Capital, definitely go to their website. There are others and see you which one is more beneficial than the next. So I actually did complete that and have been kind of engaging with investors to kind of see. It is just a matter of wanting to do it on favorable terms, and so doing that. Managing the team. A lot of it is kind of managing kind of the technical process and how Rhys thinks we are doing it and managing people, because Rhys also does code as well. So it is a pretty busy trouble board that we have, and so it definitely takes more than one person to go through and kind of keep everyone on track because things are pretty crazy right now. Michael: Yeah. What has been your biggest hurdle to launching MathGames.com? Bill: I think just learning what technologies would work best, because just the net is so fragmented. The cutting edge stuff that you want to do, you look at it first; you are like: “This is great. It works on an iPad perfectly, and this is where education is going. Everyone has iPads and this is perfectly designed for an iPad.” And then you look and we go live, and we look at our stats, and oh, great, well, iOS 8 does not support what we are doing. So now we have to go back and it is like step-by-step fix it. Everyone going back, and we are the people that have four-year-old browsers and we are the people that have ten-year-old browsers. And so, it is a process and we have kind of worked our way through it. Michael: Yeah, I spent a little bit of time developing apps for mobile phones. And just dealing the iPhone iOS system was enough to drive you crazy with all the form factors, but nowadays, yeah, you are developing math games. Not only do you need it on old browsers because schools have not updated their browser even though it is a security issue, but now your parents are going to fire it up on an Android or an iPad tablet, and then they are even going to hand their kids the phone, and they expect your system to sign in their kids and work exactly the way, in a mobile format, that it does on the desktop. Bill: Yeah, and this is the first project we have ever done mobile first actually, because I think tablets are more important that mobile phones. And the neat this is we have built it and it looks pretty good on the web, but where it really actually looks good and what I really focus on when I was designing it was on a tablet. And it was nice when launched it. We looked at all the different bounce rates. Of course they are all higher than we would like, but the one that was the lowest on iOS devices. It was half of what the other ones were. So, if you look at it on an iPad, I think it looks pretty nice, and that was kind of goal that we wanted. And now, like I mentioned, we have to go back and kind of optimize and tweak, and maybe make custom versions mostly likely for mobile devices because questions and positions and formatting changed, but it is a difficult process. I mean it is fragmented and before you could ignore mobile and now it is kind of like you deal with that first. And whether you make an app in HTML5 and it works on your iPhone or your Android device, you have to look at distribution. So you have to think: “Okay. Well, this HTML5 application on the web works, but how are you going to get it out there?” So now you have to look at: “Okay. Well, let’s bundle it into an app.” And even though you are getting kind of the same experience, it is probably a little when it is programmed specifically for a device; you need distribution on that platform. So, from a developer perspective, it adds a lot of work and you really need smart people that have worked on all these platforms that can tie it together. So, we have been able to do that. And we have not launched in iOS, but because of the technology we use, it is not going to be too far that we can do that. Michael: Cool. All right, Bill, here is the final question for you. If you had to look back at your days years ago, working as a website administrator for Alberta Health Services – so, your day-to-day job was managers would ask you to make changes to a website and you would update the website. Before you started your gaming empires that exist today, what is the one piece of advice that you would offer to aspiring entrepreneurs like you were back then? Bill: Yeah. Do not shy away from doing crappy work because, at entry level, that is really the kind of work that you are going to get. So, if you have the perception that you are going to be getting all the best jobs, you are going to be disappointed every day. So go in there and, whatever you get, just approach it. Do it well. Do not get caught up in what you are doing because, at an entry-level job, that is literally what it is about. And now, kind of where I am at now, we have people and interns and things like that. The ones that do well are the ones that approach this work in a positive manner, because it is not going to last forever. It is part of the learning process. It is kind of like paying your dues. Approach it with a good attitude because you are just going to enjoy work. You are going to enjoy life better. If you are looking to see like what you can do, I mean having a day job is pretty important because you learn things in the office that are different than you learn in a startup environment. So, discipline. You learn how to interact with other people. It is pretty important that you kind of have experiences in both, and so my advice would be just to embrace it all and do it with a positive attitude because positive attitude opens up doors everywhere. If you are kind of bitter or jaded, or think: “I want to university; I do not want to do X job,” well, you are just not going to advance in that job and you are still spending your time there. So, approach it, look for opportunities, and now there are so many more startup communities in co-work locations where you can rent a desk for a hundred, two hundred, or maybe three hundred tops dollars a month and you can be in those environments. You can go to meet-ups and you can see. Okay, I am a developer, or on the business side, or designer. And you can see if maybe there are opportunities to do those different areas. If you do not have kind of a foundation, you get desperate and you do work for things that you probably should be spending your time doing. Bill: A bunch of different advice I guess, but somewhere in there, there is some. Michael: Great advice. If you have questions for Bill, please post them in the comments below the video and we will ask him to come back and answer as many as he can. If you want to say thanks to Bill for coming on the show, post a comment below or use the link just below the video to post a tweet and say thanks to bill. We have got it all prepackaged for you. It opens up Twitter to Bill @Karamouzis on Twitter. You are coming to the TRAFFIC Conference, right, Bill? Michael: All right. So, if you want to meet Bill in person and you want to say thanks to Bill in person for inspiration, for the background he has provided, for this insights, come to the TRAFFIC Conference in October, in Florida. I will be there as well, and you can thank Bill in person. 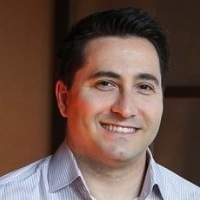 Bill Karamouzis, Co-Founder and CEO of TeachMe. Thank you for coming on the show, sharing your knowledge about startups and exact match domain names, and thanks for being a Domain Sherpa. Bill: Thanks Mike. I appreciate it. And everyone, I would love to touch base and send me an email. Break something on the site, let me know, and good luck with whatever you are doing, and thanks for listening. Michael,again great interview.Always look forward to receiving information from you in my inbox. Bill,all the best with the new venture. This interview has prompted me to ask a couple questions about a generic domain that I own that has very high Exact Monthly Global Searches – would it be best develop this sort of domain or just park it? Thanks Basil glad you enjoyed it. Unfortunately there are many factors you must consider before developing, global search volume is not high on the list. I remember checking for games.com typeins on the old overture search tool – addictinggames.com would be absolutely massive! I was wondering would Bill have any advice on starting an arcade now. I think you really need to find a way to stand out or come at gaming with your own unique angle. How will you make it better than whats currently out there. Research the options of solve problems are find while you are gaming. Great Interview as usual. Thanks to Bill and Michael. this domain parked?? same question with cookinggames.com…. Thanks, Homero. Bill should be checking in soon. I have not owned mathgames.com long enough to get a full sense of what the yearly average PPC income will be. Cookinggames.com for the time it was parked was making around 45k a year. The domains I bought from Chris which included animation.com, coolgames.com, cheapgas.com and a few others. For parking companies I think its best to test. Every major provider has domains it does well on and ones it doesn’t. At this time of this post I’m using InternetTraffic and Rookmedia. But I’ve also used skenzo, fabulous and others over the years. Sorry I mean it takes two to tangle! Bill.and good luck. Bill; Good stoff. I takes two to tangle. Thanks for watching and commenting, Boluji. Bill Karamouzis – very sharp mind, good luck with your new projects in gaming area. Agreed. I can’t wait to see where Bill and his company goes! Thanks for sharing, Bill. Great job as always, Michael. Bill is a very sharp guy. I wish him the best in his new venture. Given his track record, I’d bet this new business will be a smashing success as well! Congrats Bill and best wishes.